Having undergone a recent facelift the A8 3 Litre TDI version now gives back up to 47.9 miles per gallon. Every dial, switch and button within the exterior is expertly placed and with the finish being improved the interior really is a place to relax as a driver or passenger. There’s a 4.2 Litre TDI engine with enough torque to trouble a supercar and able to reach speeds of 62mph in just 4.9 seconds. There’s also the Quattro option which improves the road hugging and agility no end. The Audi A8 ticks all the boxes and can be had in 3 versions, the S8, A8L and S8. Which you go for is up to you. The S8 being the top of the range model with a reputation of being the ultimate in luxury saloon cars and packed with a 4 Litre Twin-Turbo V8 engine there’s no getting away from the fact the power is there if you need it. 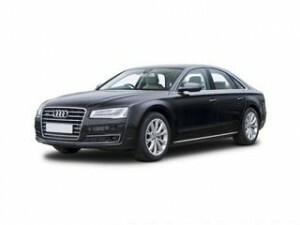 Of course with a top of the range Audi A8 comes the price, however we can significantly reduce this and potentially save you thousands with our online free quotation service. See how much you could save on a new A8 today with Coast2CoastCars.